DC port output 20V~15V (Max 90W) for Compatible with Apple Retina MacBook Pro 13 15-inch and MacBook Air 13, 11-inch (2012-2015 Magsafe 2 T ac adapter), MacBook Pro 13 15 17-inch (2006-2012 Magsafe L tip ac adapter). QC 3.0 USB Ports output 5V/9V/12V 15W Fast charging for Quick charge tablets and smartphones. USB A Ports Output 5V Max 25W Charge for tablets, smartphones and more 5V USB Charging Devices. The BatPower ProE 2 Travel Charger Tested for 2015 to 2006 Apple MacBook Pro MacBook Air Mac Laptop / Notebook MBP MBA(Retina and older Mac Models). Charges for MacBook Pro 1 times, Macbook Air approach 1.5 times, iPad Mini 1 approach 2.5 times, iPhone 6 times, Recharges in around 2-3 hours via BatPower 90W A90 Ac Adapter (included). EX7 size: 6.5 inches (L) x 3.2 inches (W) x 0.7 inches (H) Weight: 15 ounces. 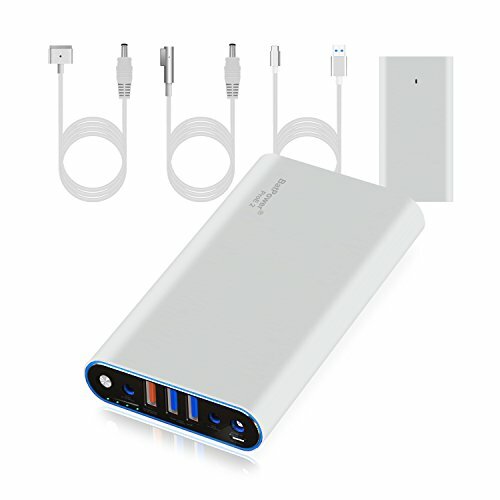 Packing list: BatPower ProE 2 EX7 Portable Travel Charger for Mac, A90 90W Slim Ac Adapter for Mac, MagsafeL and Magsafe2 T Cable, USB to Type C Cable, Adapter Cable(charge for ProE 2Portable Travel Charger), AC Power Cord, Instructions Manual. (Note: if Sold by Euro, will be packed UK and EU Power Cords).